Canyon Creek Commercial Center is a 240 acre mixed-use development located at the intersection of Interstate 15 and Highway 6 in Spanish Fork, UT. This development will includes health care, commercial, retail, and a new movie theater. 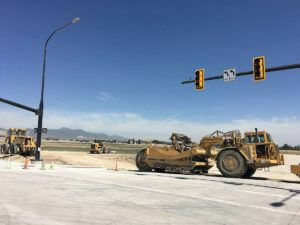 Geneva Rock was contracted to provide the earthwork, new utilities, site concrete, grading and paving for the commercial buildings and roadways. The project started with one phase but soon after has evolved into 3 phases that includes the structure for the box stores and other buildings. The project faced some challenges working through winter months to meet schedule as well as a lot of design changes. There were multiple timelines to keep with tight deadlines for the various incoming tenants that kept things moving quickly. We worked with our sister company, Sunroc on the phase 8 and 5 portions of the development.